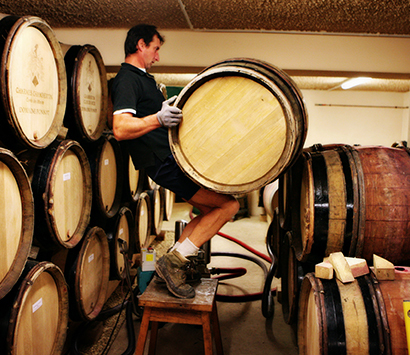 Our wines are aged in oak barrels for two years. We never use new barrels. 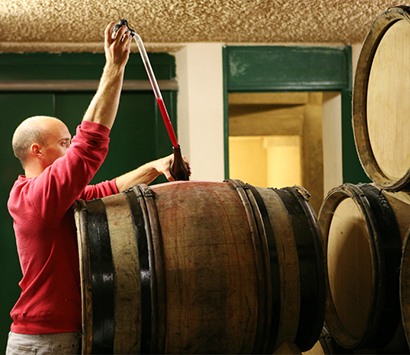 This is because the natural ageing cycles of wines from Burgundy grape varieties are slow and require careful handling. With new wood, which is still very porous, the exchange with the outside of the barrel takes place too quickly. In addition, the taste of oak, even if natural in principle, is not original and is neither a feature of the terroir nor the grapes. We produce WINE and not wine- and oak-based drinks… We generally rack once, if possible a long time after the second fermentation is finished, and sometimes the wine is bottled without racking (2003 for example). Racking and bottling are always carried out under a waning moon and high atmospheric pressure. Our wines are neither fined nor filtered and we use very little sulphur. Regarding SO2, we use it as an antiseptic on the grapes when they are crushed and vatted. With the alcoholic fermentation, the sulphur dioxide almost completely disappears. To limit its use, the wine must not be exposed to oxygen. We therefore make sure that we fill our barrels as often as necessary. During the racking and bottling phases, the wines are not in contact with the air at any time as we use nitrogen or carbon dioxide, or a blend of these two neutral gases. Using these heavier-than-air gases is very easy and we now have more than 20 years' experience in this area, starting our first experiments in 1984 and stopping the systematic use of SO2 from the 1988 vintage onwards. Furthermore, we believe that the elements that make up the wine, provided that nothing has been done to remove them, are sufficient to ensure natural protection against most forms of contamination. However, in cases of extreme danger, we can use SO2 in order to ‘treat’ a wine, in the same way we would take medication to avoid dying from a disease. For example, all of our 2003 wines, where the volatile acidity was very high, were ‘sulphured’ at minimum doses. We systematically analyse all of our barrels and only treat those in which the volatile acidity is rising to a dangerous level. A blend is made from each cuvée before bottling and we always start with the non-standard bottles, jeroboams, magnums, etc., and finish with the 75 cl bottles. Since the 2010 vintage, our wines have been bottled on a new ultra-modern bottling unit, custom-built for Domaine Ponsot.